Let’s write equations for vertical and horizontal lines. Plot at least 10 points whose $y$-coordinate is -4. What do you notice about them? Which equation makes the most sense to represent all of the points with $y$-coordinate -4? Explain how you know. Plot at least 10 points whose $x$-coordinate is 3. What do you notice about them? Which equation makes the most sense to represent all of the points with $x$-coordinate 3? Explain how you know. Draw the rectangle with vertices $(2,1)$, $(5,1)$, $(5,3)$, $(2,3)$. For each of the four sides of the rectangle, write an equation for a line containing the side. A rectangle has sides on the graphs of $x = \text-1$, $x = 3$, $y = \text-1$, $y = 1$. Find the coordinates of each vertex. There are many possible rectangles whose perimeter is 50 units. Complete the table with lengths, $\ell$, and widths, $w$, of at least 10 such rectangles. The graph shows one rectangle whose perimeter is 50 units, and has its lower left vertex at the origin and two sides on the axes. On the same graph, draw more rectangles with perimeter 50 units using the values from your table. Make sure that each rectangle has a lower left vertex at the origin and two sides on the axes. Each rectangle has a vertex that lies in the first quadrant. These vertices lie on a line. Draw in this line, and write an equation for it. What is the the slope of this line? How does the slope describe how the width changes as the length changes (or vice versa)? 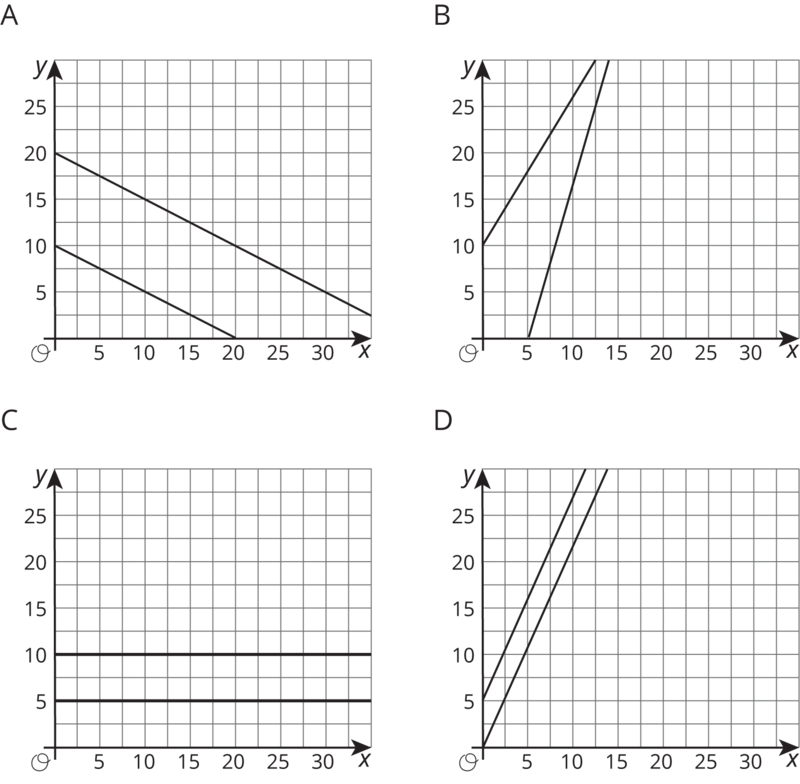 Horizontal lines in the coordinate plane represent situations where the $y$ value doesn’t change at all while the $x$ value changes. For example, the horizontal line that goes through the point $(0,13)$ can be described in words as “for all points on the line, the $y$ value is always 13.” An equation that says the same thing is $y=13$. Vertical lines represent situations where the $x$ value doesn’t change at all while the $y$ value changes. The equation $x=\text-4$ describes a vertical line through the point $(\text-4,0)$.